In the summer months of June, July and August, the temperatures rise and heatwaves occur that can cause our hard drives to stop working properly and prevent us from accessing our data. This malfunction, commonly referred to as “surface degradation” increases considerably in the summer months. 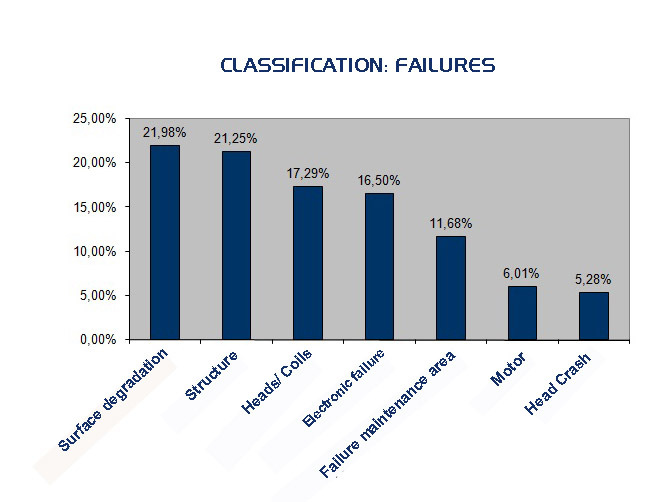 According to Recovery Labs data, in 2006 21.98% of the hard drives received in the laboratory had malfunctioned due to surface degradation, 75% of which were received in the summer months. There are many symptoms that indicate when a hard drive is not working properly due to temperature-related issues. Identifying the problem in time or even trying to stop it from happening can prevent serious problems and save you from losing data that may be very important to you or your organisation. There are multiple symptoms that indicate when a hard drive is not working properly due to temperature-related issues. The first thing to remember is that a hard drive is a piece of high-precision equipment that, in order to work properly, has a multitude of mechanical parts that must operate in coordination with one another. A mechanical deviation in any one of them can result in the information that was previously stored on the disk being unreadable. Mechanical parts are designed for optimal performance within a specific temperature range. Operating the equipment at a higher temperature than it was designed for causes stress and wear that can shorten its useful life. The stress will be greater when the operating temperature changes abruptly in a short time. In the summer, the air conditioning normally keeps offices at a room temperature of about 21ºC on workdays. At the end of the day, the air conditioning is usually switched off but not the computers, as it is becoming more common to leave them on, especially in household environments. Within just a few minutes the ambient temperature is 40ºC and the same cycle is repeated day after day. Explanation of the problem: We will try to explain as simply as possible the reason why the data cannot be read on the device that has malfunctioned. To do so, we will use a more illustrative example: an old vinyl record album. Imagine for a moment that you put a vinyl record on to listen to a particular song. You put the record on the turntable, it begins to rotate and you place the needle in the corresponding track for the song you want to hear. When the needle touches the disk, the song begins to play. Now, what if that album had been out in the sun and had got warped? The track would probably no longer form a perfect spiral but would be deformed and this in turn would cause the needle to jump to adjacent song tracks and you would not be able to hear the song you wanted to play. The same thing happens when the needle is the part that is out of balance. A deformation or maladjustment of any one of the internal parts of a hard drive can prevent the reader head from being properly positioned on the previously written section of the disk, effectively barring access to this data. 3. Can data be recovered from a device with surface degradation? The answer is yes, the information can be retrieved. To properly identify the source of the problem, the disk cover must be opened and this should only be done under the atmospheric conditions provided by a clean room. Bear in mind that the read/write head does not touch the disk when it is turning at high speed, rather, it floats on an extremely thin layer of air (10 millionths of an inch)..
Next, the torque and temperature conditions must be modified in order to align the read head and stored data. It may be necessary to modify these parameters depending on the area of the disk you are trying to read. In some cases, this can be a slow and extremely complex process. 4. More data loss problems caused by high temperatures. As we have already seen, high temperatures are one of the greatest enemies of hard drives, and not just because of thermal imbalance but also because high temperatures are the indirect cause of other equipment failures. When heat waves occur they are usually accompanied by a dramatic increase in electricity usage. This spike in electricity demand is due to the use of air conditioners and the hotter it is, the more power that is required by air conditioning systems. We have already discussed the problem of temperature changes in a given environment, but this is something different. In some cases, a massive demand for electricity may actually cause incidents in our electricity supply, such as sudden power outages, surges or peaks. In such situations, our appliances are at risk of their electronic circuits being damaged, which tragically can lead to the appliance malfunctioning or ceasing to work altogether. Exactly the same thing happens with computers. In fact, in 2006 devices with electronic malfunctions accounted for 16.50% of the total devices received. Forcing the air to flow inside the housing, placing a fan at the front for the air to enter and one at the back to extract the air from the inside. Placing the computer in an area of the room where the temperature is stable. Promoting air circulation by never placing the computer in a closed cabinet that causes the air entering the housing to be same as the air being extracted. Keeping the computer out of direct sunlight. When installing the disks inside the housing, do not install them right next to one another. Instead, leave room between them for the air to circulate and to prevent the heat given off by one affecting the others. Use surge protectors with the computer’s power supply. Ideally, you should have an Uninterruptible Power Supply (UPS) which, in addition to protecting against surges, gives you a few minutes to turn off your equipment if there is a long-term power outage. If you will not be using your computer for a long period of time or electrical storms are predicted, it is not enough to just turn off your equipment. You must unplug the power supply cable from the socket. “A loss of data does not occur when a computer breaks down or stops working properly but rather when it breaks down and we don’t have a back-up copy of the data it contains”.